﻿This is a BT music hat. It can available for most of BT devices. Own it, you can have a warm feeling for your head and hands while you can enjoy music or have a call. 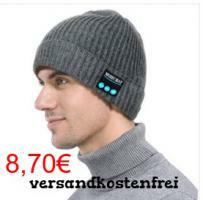 Also, this kitted hat is pure color, its simple style shows your great fashion taste. Oder sollen wir Ihnen eine E-Mail schicken, sobald neue Hut & Mütze Angebote aus Köln (+40 km Umkreis) inseriert werden?